I have meant to write something about our recent travels with Rinpoche, but it has been so busy around here that I have not gotten around to it until now. I don't travel much. Home is where you will usually find me or walking somewhere nearby. The exceptions to that rule are when we go to see my kids and grandkids or traveling to see Rinpoche. The Ven. Khenpo Karthar Rinpoche has been Margaret and my dharma teacher for over thirty years. He is over ninety-years old now. In this whole wide world of consequences, I consider being fortunate enough to meet and study with Khenpo Rinpoche to be way beyond lucky. It has been, for me, nothing short of miraculous. So the opportunity to travel with Rinpoche for a week was a natural. We had to go. It began at the Ann Arbor KTC (Karma Thegsum Chöling), about three hours from where we live here in Big Rapids. Ann Arbor is one of Rinpoche's centers, and he was to give a teaching on the bardo and offer the empowerment of Amitabha, the particular Buddha most associated with death, dying, and the bardo. We would go. As life would have it, it turned out that one of the Ann Arbor center's staff was not feeling well, so Margaret and I were asked to cook Rinpoche's dinner the night he arrived. Rinpoche was traveling with his attendant Lama Karuna and translator Jigme Nyima. Rinpoche does not speak English. Shopping and cooking for Rinpoche on short notice was, well, a bit frantic, but we managed to produce a dinner that I hope was reasonably OK. That was a Thursday evening. Then, on Friday, there was a public talk, followed by two days of bardo teachings with rinpoche. My daughter Anne attended along with my granddaughter Emma, now almost-two-years old, and my friend Tyler Duncan. Of course many others were there too. Emma was quite well behaved and would occasionally punctuate the goings-on by standing up, pointing at the shrine, and declaring "There is the Buddha!" or pointing at rinpoche and saying "Khenpo Rinpoche," repeatedly -- things like that. Monday morning, after the weekend teachings, we picked up Rinpoche, Lama Karuna, and Jigme (plus all their suitcases, etc.) and headed for Athens, Ohio, where Rinpoche has another one of his KTC centers, driving almost all the way to West Virginia. We stopped for lunch along the way at a Chinese restaurant and had a vegetarian meal. Rinpoche does not eat meat, eggs, and so on. The weather and roads were still good. We got to the Athens center in mid-afternoon Monday and found that Rinpoche would be staying at a home some twenty minutes outside of Athens. Although upper Ohio is mostly flat, as we got closer to West Virginia, it was all hill country. Rinpoche was staying in a house perched high on a ridge, looking out over a valley. The driveway looked more like a luge run than something I would voluntarily drive on, but thankfully there was no snow or ice while we were there. Our host was a nurse (and wonderful woman), who was also a serious herbalist. Her house was filled with every kind of tincture and dried herb I could imagine, and then some. Margaret and I were there to help make sure Rinpoche was comfortable and to assist the Athens KTC staff however we could. What followed were several days of relaxing for Rinpoche, plus a public talk, before he moved on to Chicago to another of his centers. Margaret and I helped prepare meals, which were mostly handled by Athen's KTC member Steven Kropf. We had brought with us whole oats, which we carefully prepared for breakfasts. It takes hours to cook whole oats, but they are wonderful. I did a lot of toast making and preparing fresh-fruit plates. The dining area was in a small room, filled with herbs, and it was all very cozy. Rinpoche joined us for meals and we had a great time. 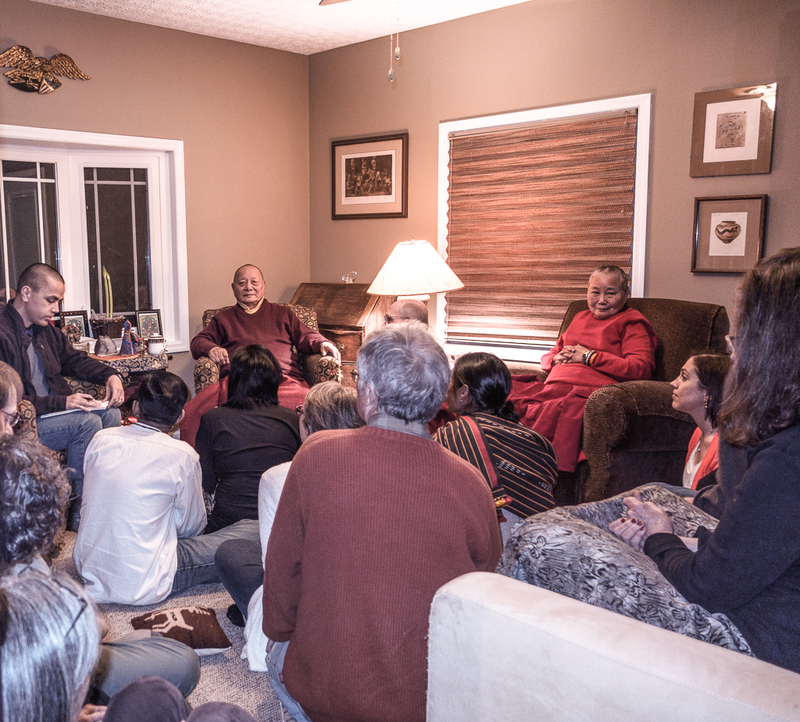 I could tell Rinpoche was enjoying himself because he told lots and lots of stories. The visit was a lot of fun and the public talk so well attended that they overflowed the 150 chairs that had been set up and had to pull out folding chairs. I don't know how many people were finally there, but the room was full. On Thursday afternoon we all piled back into our car and drove to the airport at Columbus, Ohio, where Rinpoche and crew would fly to Chicago for a weekend teaching there. No sooner had Margaret and I dropped Rinpoche off at the airport than it began to snow. And it snowed into a blizzard. We had to drive from Columbus to Ann Arbor, where Emma (my granddaughter) was having a birthday party. She was two-years old! Well, it was a tough drive, in blizzard conditions, with cars off the road all over the place and huge trucks thundering by, while we just crept along. The good news is that we made it, and barely in time for the end of the party, and some food! Margaret and I were exhausted by the drive through the snowstorm, and so glad to have made it there safely. Remind me not to drive in that kind of weather any time soon. So that's a brief overview of our trip with Rinpoche. I wish he were here at our center now!